Flying in the sky? Above the crystal, beautiful, turquoise ocean – try Punta Cana Parasailing! This excursion combines yachting and skydiving. 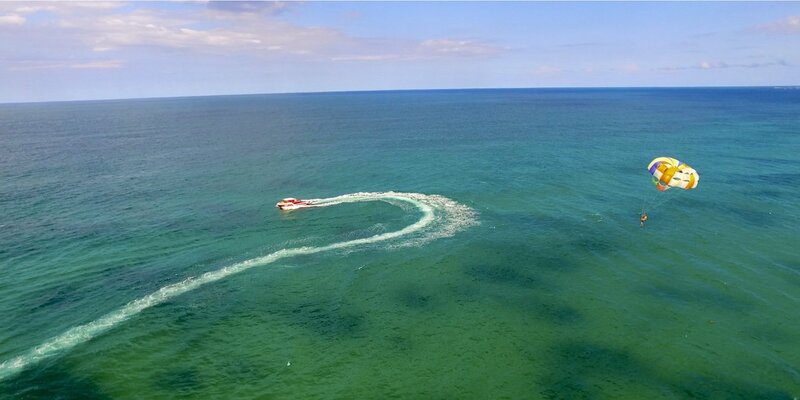 You don’t have to worry – your parasail will be safe. Provided by a licensed company. Our technicians are constantly checking the boat and all equipment. That’s why your trip will be safe and amazing. And of course, you’ll have a lot of fun! Just imagine this… You are cruising along Punta Cana’s coastline. Watching spectacular, bird’s eye view of Punta Cana with its turquoise ocean, palms, and paradise. We are sure that you will definitely like such an unforgettable experience! 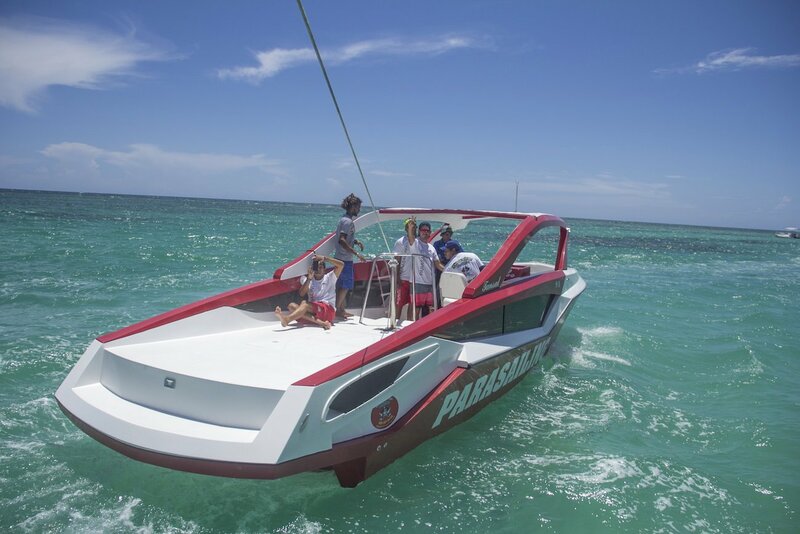 Book online Punta Cana Parasailing right now on this page. Still have doubts? So, ontact us for more details. 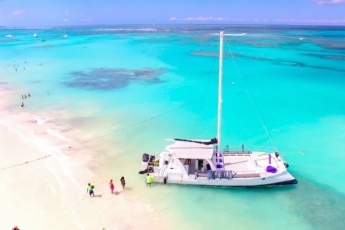 Parasailing Adventure, includes pick-up and drop-off from any hotel or area of Bavaro/Punta Cana modern buses with air conditioning system, expert drivers, accompanied by a professional multilingual guide. Pick up in the afternoon depends on the season. Please contact us for more details. We will contact you shortly with the exact time and pickup location. Duration – around 2 hours. What to bring: Closed shoes, swimming suit, good mood. + Comfortable Transportation, modern shuttles with AC and expert drivers – two way. What you should bring with you! The unique thing to do. Lifetime memory. Book your unique Punta Cana Parasailing experience now! Needed to see the luscious terrains and spread of greens on the Punta Cana soil, I couldn’t but opt-in for the crazy fun height challenge of parasailing. I had the utmost confidence that I am in with the best team of professionals. I highly recommend this if you like heights. Very scary experience, but I loved it nonetheless. Would have preferred if it lasted a little longer though, as the view from the skies is simply breath-taking. It’s almost like the trailer of a really good movie, you just get glimpses of the action and before you know it the trailer is finished. It was an absolutely fantastic experience! So calm and relaxed when you arrive there! I've always had doubts about the safety of parasailing after hearing many stories about whether it was real or rumored. From the first moment we talked to the staff, they assured us about their qualifications and training, as well as the number of flights & trips they had made. It was a first class experience! Can I book Punta Cana Parasailing if I don't have any experience and skills? No special experience and skills are needed. 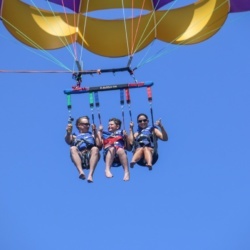 You can book Punta Cana Parasailing and try this unforgettable experience! How long does Punta Cana Parasailing last? Punta Cana Parasailing excursion lasts about 2 hours. It includes yachting and skydiving. Especially skydiving is a short experience. It lasts about 10-15 minutes. What should I wear for Punta Cana Parasailing excursion? For Punta Cana Parasailing excursion your clothing and shoes should be comfortable. It is advisable to wear a swimsuit, but you can also put on a T-shirt and shorts. Can I take pictures during Punta Cana Parasailing? Yes you can take photos during your Punta Cana Parasailing experience. But we doubt that it will be comfortable for you. You can wet or drop your camera into the water. However, we have a photographer who, at your desire, will make some excellent photos in memory of your Punta Cana Parasailing. Is Parasailing Punta Cana dangerous? Punta Cana Parasailing is absolutely safe. 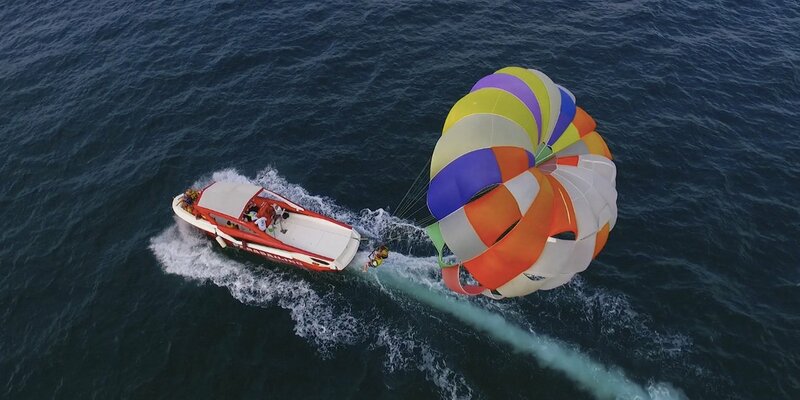 We operate Punta Cana Parasailing when the weather is nice and sea conditions are good. Moreover, our technicians are constantly checking the boat and all equipment. Can I try Punta Cana Parasailing if I am pregnant? For safety reasons, pregnant women are not allowed to go parasailing. But we will be waiting for you when you get back next year to try Punta Cana Parasailing experience with us! Will I be accompanied by an instructor during my Punta Cana Parasailing experience? That is unnecessary. You will be given all the instructions on the boat. Punta Cana Parasailing is absolutely safe. Book right now your unique Punta Cana Parasailing experience. Do I need be physically fit to try Punta Cana Parasailing? 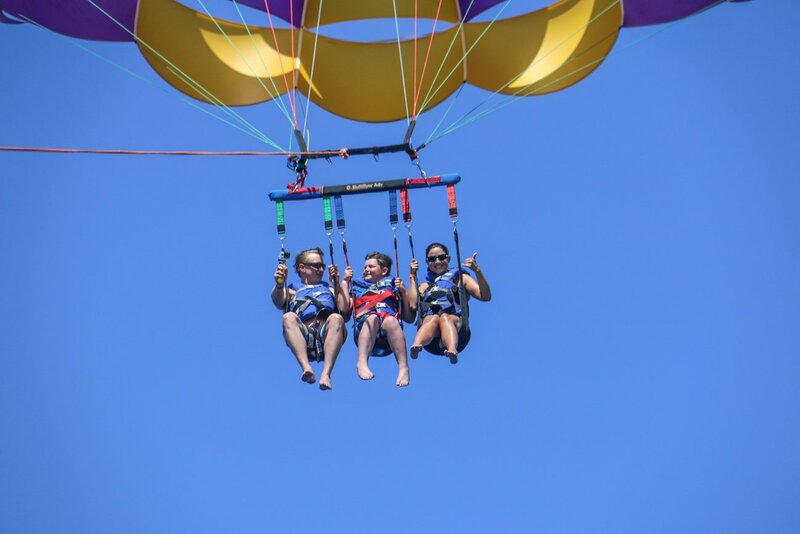 No special experience is needed to try Punta Cana Parasailing. Just sit back, relax and let our professional team make your Punta Cana parasailing experience unique! I would like to try Punta Cana Parasailing. Do I need to be able to swim? No, you do not need to be able to swim. Moreover everyone is required to wear lifejacket while parasailing. Try our safe Punta Cana parasailing! Enjoy skydiving and spectacular views! Is two way transportation from the hotel included in the Punta Cana parasailing excursion price? 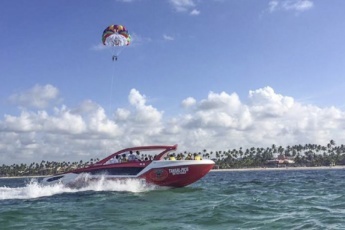 Yes, two way transportation from Punta Cana / Bavaro in modern buses with AC is included in the Punta Cana Parasailing excursion price.